We were recently invited to contribute to Home Business Magazine, a print and digital publication that provides business tips, news and insights to current or aspiring home-based entrepreneurs and business owners. 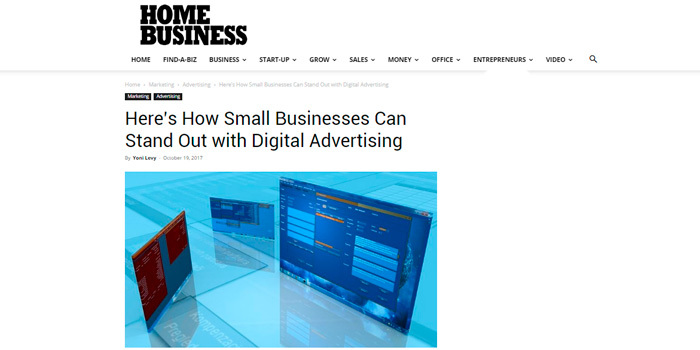 While our advice on using banner ads to stand out from the competition was tailored to home-based entrepreneurs and business owners, the insights we shared hold true for enterprises, publishers and agencies. You can check the article out here. If you’re a regular reader of the Digitaland blog, you’ll recognize some of our favorite themes in the Home Business article – the importance of building non-intrusive ad experiences, the power of personalized display advertising and the big impact banner ads can have on both brand awareness and the bottom line. They’re timely reminders as we head into the holiday season. And if you need some help taking your banner ads to the next level, drop us a line for Online banner ads!